Baby Carson came to Hilliard, OH to visit top Columbus newborn photographer Lynn Leitch for his newborn photography session. He slept so well during his entire session, and while he cooperated during his naked shots, he was a very happy little guy once we got him all wrapped up – he just snored away while we switched props and poses! Mom and Dad were able to sit back and relax during the session and we had a wonderful time getting to know each other! I always enjoy getting to chat with Mom and Dad about the first couple weeks as parents and see if there’s any advice I’m able to give – but Carson’s parents have this down! They even said they’re already getting some sleep at night! Hopefully we didn’t just jinx that! Each session that I do I am falling more in love with the natural posing and more simply style of newborn photography – so I think you’ll slowly start seeing a pull towards that style and less props being used. Carson helped me love this even more! Check out some of my favorites from his session! I love when babies show up in the most adorable photos that I have to include those in the gallery as well as the naked and wrapped shots. How adorable is his little blue outfit? 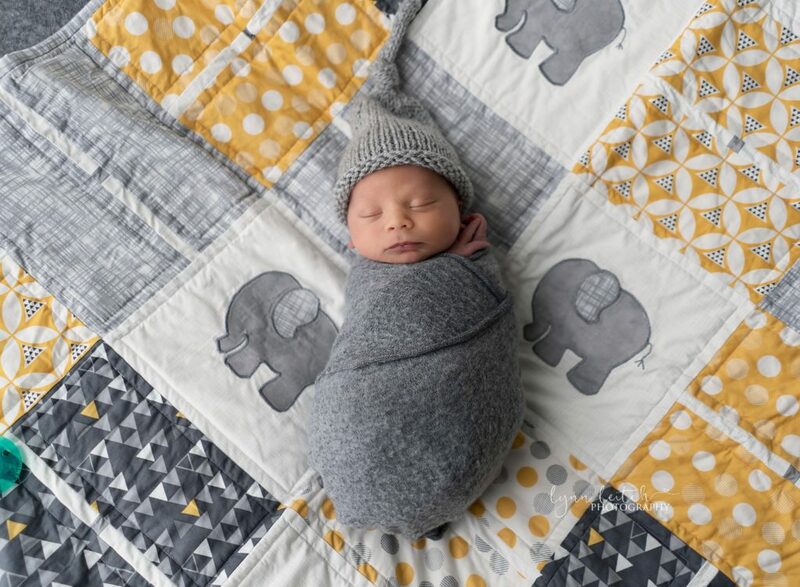 How adorable is this blanket that his Grandma made to match his nursery? I loved that Carson’s Mom & Dad waited to find out if they were having a boy or girl – but its so funny how every “gender neutral” item can then really look either boy or girl once you know what the baby is. Simple and natural. I’m currently buying every white, ivory and grey backdrop I can find!